Updated Sunday January 27, 2019 by Shore Little League. 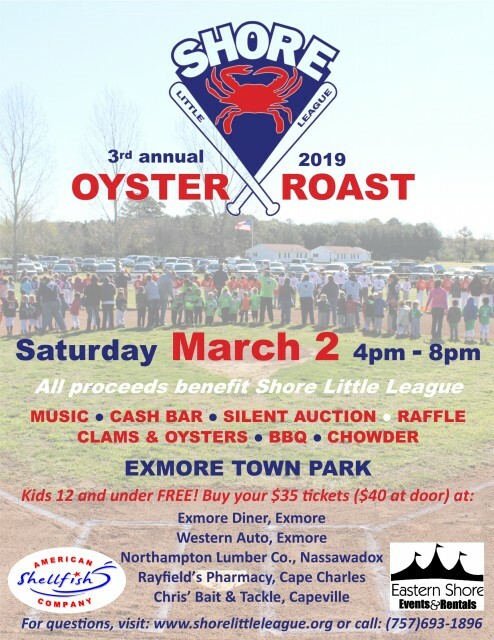 Our 3rd Annual Oyster Roast will be held March 2nd from 4-8pm at the Exmore Town Park. Tickets are $35 each in advance and $40 at the door. Kids 12 and under are free. Tickets are available at Western Auto- Exmore, Exmore Diner, Northampton Lumber Co- Nassawadox, Rayfields Pharmacy- Cape Charles, and Chris' Bait and Tackle- Capeville.